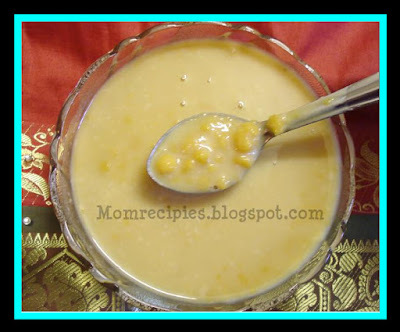 This Payasam is popularly known as Senaga Pappu Payasam in Telugu and Kadalai Paruppu Payasam in Tamil.Yesterday I made it as a prasadam /offering for navratri. My Family loves this payasam as this is bit different from the other payasam varieties. The taste is delicious and is unique as we use jaggery and coconut . 1) First wash and pressure cook the bengal gram with 1 1/2 cup water till it is cooked ,but take care it does not get mashed. 2) Grind the grated coconut with little water in a mixer to a smooth paste. 3) Melt jaggery in half cup of water and remove if any dirt. Cook it till jaggery is dissolved. Then add the grated coconut paste and cooked bengal gram and mix well. Then add the milk ,cardamom powder and cook on low heat for 5 - 7 minutes.Switch off the stove. 4) Heat a pan with ghee, roast the cashew nuts. and raisins and add to the cooked payasam.